Q: What does your company do? A: Viakable manufactures wire and cable for different industries. We specialize in high-end engineered cable for different applications. We have been manufacturing products for the energy, automotive and construction sectors and we are currently expanding our product range to service the aerospace industry. Q: What is your role there? A: I am head of the engineering process at the flexible cord plant. 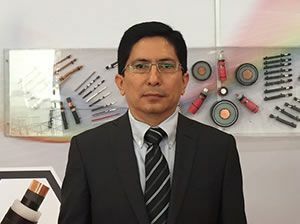 I am responsible for optimal standards and conditions in our machinery so that our operators can manufacture our products efficiently and meet our quality requirements. Q: What do you like best about your position? A: My position involves finding solutions for new challenges. It demands constant collaboration and teamwork with other areas, such as production and maintenance. Q: How has your industry most changed? A: Industry changes in the automotive sector are driving changes in our industry as well, with new ways of doing things and new products and developments. In general, Mexico´s trade agreements have made our country more competitive with more wire and cable competitors in our local and international markets, driving changes in the way we work to do things more efficiently. Q: How does your company remain competitive? A: First by understanding our client´s requirements and working closely with them to meet their needs, but also through innovation. Our company is very interested and supportive in developing an innovative culture. Our people participate in innovation programs to explore different markets and industries in order to understand new industry trends and remain competitive. We have many training programs to develop our skills.